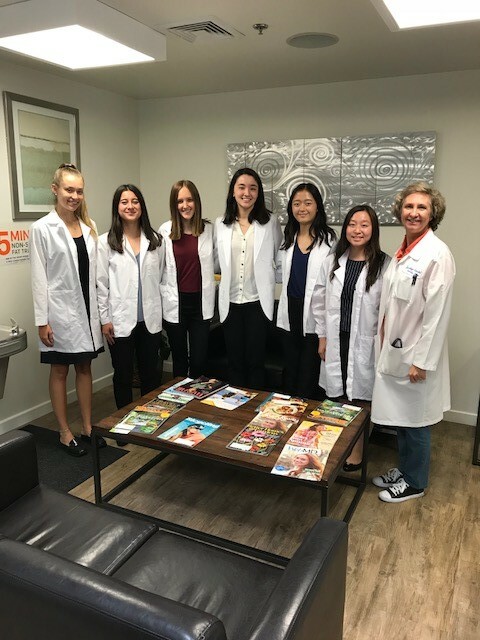 The genesis of Internist Jossalyn Turner Emslie’s ’83 internship program was simple enough: girls in her daughter’s Girl Scout troop asked if they could shadow Emslie and word spread on the Westridge campus after the program’s first year. But Emslie, passionate about female mentorship, especially in medicine, reached far past a shadowing program to develop an intense, once-in-a-lifetime experience for Westridge students (and a few other girls as well). “High school girls don’t know enough yet to get a lot out of shadowing a doctor,” said Emslie. So, she created a formal (and jam-packed) curriculum to help students see what it looks like to work in different specialties or be a researcher, understand what it takes to get into and through medical school, consider the challenges unique to women in the field, and learn how to access mentors and other educational and professional opportunities. In the field of medicine, she said, women perform differently and are viewed differently by patients. Because of that, she believes it is important to have women in the caring professions. Yet women are still underrepresented in medicine, especially in top positions, and are paid less—a gap that is increasing, unlike the overall gender wage gap. "I am forever grateful to Dr. Emslie for welcoming us into her world with such open arms and giving us the opportunity to network, make new doctor contacts, and witness all the beautiful things about medicine." Of note—this story contains one other Westridge connection! Emslie works with Westridge parent Hani Sami, M.D. (Nathalie ’12) in the Sierra Madre medical group he founded. This story was originally published in the Winter 2019 edition of Surgere Magazine.